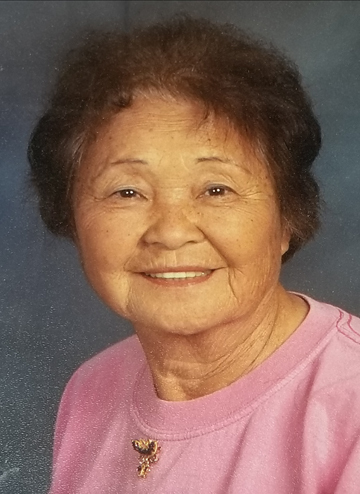 Ann Lee Hage, 87, of Elbow Lake, went to join hands with God on March 18, 2018 at the Minnesota Veterans Home in Fergus Falls. Ann was born on June 26, 1930 in Seoul, South Korea. She came to her beloved home on Point Comfort in 1959 as a bride to Eugene L. Hage (SSgt, ret, USA) who predeceased her in 1990 from complication of agent orange. Also predeceasing her are her parents; two sisters; and mother-in-law, Mabel T. Hage. She is survived by two brothers, Jon S. Lee and Chul S. Lee of Seoul; daughter, Mary Hage (Pat Casey) of Reno, NV; grandchildren, Kelli Woo (Edward) of Sparks, NV, Amanda Casey of Reno, NV, and Adam Casey of Chicago, IL; and numerous very loved nieces, nephews, and friends. Though she was unable to have her own children, Ann loved ALL children. She lovingly adopted and raised her half-sister, Mary. Like any mother, Ann helped Mary to grow into the person she is today. Ann loved dogs, and there never was a dog who didn't like her. They knew a treat of backon, hamburger or cookie was at hand. They just didn't know where she would pull it out of. Ann was a workaholic and worked till age 70. Rosenblatts in Fergus Falls, Cosmos in Elbow Lake, Evansville Nursing Home and numerous PX’s around the country and world were some of her employers. As she and her husband were transferred from post to post, home was always Point Comfort, where she could watch God’s creation from her deck. Donations in her memory may be directed to the Grant County Humane Society - , 1015 State Highway 79 East, Elbow Lake, MN 56531. Funeral Service: 3 PM Sunday, March 25, 2018, at United Lutheran Church in Elbow Lake, with visitation one hour prior to services at the church. Arrangements by Erickson-Smith Funeral Home of Elbow Lake.